Memory is such a tricky fish. I love the way it comes for me in pictures, scents, the echo of words. A smile. A shiver. The flicker of something elusive. Something forgotten. It’s this everyday quest to remember that drives so much of my writing. How we mark the past, understand events and make heroes and villains of people, how we interpret history and piece together narratives from its soup gives shape to who we think we are, who we want to be, the hopes and values that make us us as a bunch, and individually. But it’s a quest that comes laid with traps – disguises, lies, mirages, dead ends and precipice edges – that only grow in number and trickery over time. Memories are nothing if not utterly untrustworthy characters. 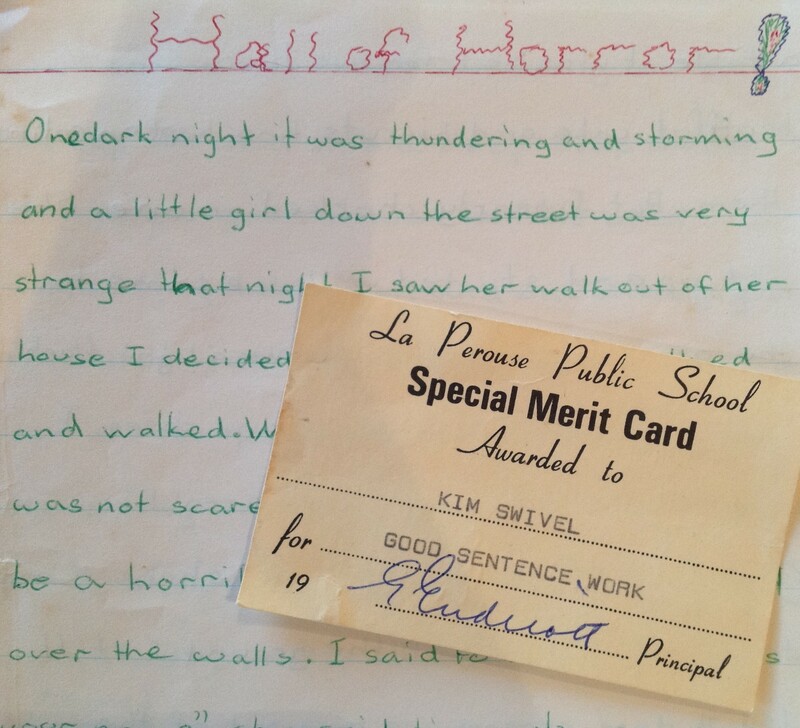 I met a lovely one of these a couple of days ago, going through a long-neglected box of bits and pieces my mother had kept from my childhood – scraps of schoolwork, letters, cards, theatre programs from my old tap-dancing days (best forgotten). In among it all, I found my very first attempt at writing a story. It’s most definitely my handwriting, possibly from around year five or six – I’d have been about ten or eleven when I penned it. But the thing is, I don’t remember having written it at all. I remember the story sparklingly well. I remember sitting in the cold, shady area at the front of La Perouse Public School at lunchtime and marvelling at it, wide-eyed. But in my memory, it’s my friend Diana Hoffmann who is writing it. She was a master horror story teller – her parents let her stay up late on Saturday nights to watch films like Dracula and Frankenstein. They were German and had a black Labrador called Fritz who could fart for Deutschland. I’m doodling drops of blood around the margins of her story, and wishing I could invent one as fabulous as hers. There’s not a writing day goes by that I don’t remember it was Diana who somehow switched me on – showed me some magic, shone a light up the path of how stories are made. I’ve always wanted to thank her for this, but we lost touch after going separate ways in high school, and I’ve never been able to track her down. I still can’t quite believe that I had a crack at writing such a Diana-inspired tale myself. But here it is, in green and red. It’s only three pages long, abandoned before it was really begun. But it is the very beginning of all my scribbling days. Where did I write it? In secret, in my bedroom? How did Mum get her hands on it? How is it that even at this tender age I seemed destined to bring a bit of weird kid to cliché? Does it matter that my memories tricked me into thinking that this story was Diana’s alone? No. What matters is that somehow I am forever honouring what she gave me. I wish I could tell her this. I wish we could share a laugh, reminisce. But in lieu of that, and until we do, I’ve framed the front page of my ‘Hall of Horror!’, along with a merit award for ‘good sentence work’, which I don’t remember ever having received either, and I’ve sat it on my desk as fact. Evidence of how fragile, how precious our memories are. And a reminder that the quest for catching the truth in them is one that’s always worth making. oh how what a memory of the old school days – flashbacks and all of the book nook!